Well, I imagine there are at least a few of you who remember seeing this truck for sale last summer. It's a 1976 Mikado, and it's bone stock and original. I'm very excited about it now because I finally got everything squared around and working, but at first I was pretty sure I paid too much. Even though the engine had a new top end when I bought the truck, it soon became apparent that the power plant, and I use that term rather loosely, had some other issues. While the truck did run when I bought it, the idle speed was set way too fast, and when I slowed it down, the oil pressure tanked. Come to find out quickly, once I dropped the oil pan, that the rod bearings were so badly grooved that oil was bleeding by and killing the pressure. After replacing the crank and all the bearings, everything was fine in the engine. The stock Hitachi carb was crap, so I replaced it with a rebuilt one because I wanted to keep the stock air cleaner. The fuel pump then crapped out, so I had to replace that. And finally, the truck overheated like crazy, but I fixed that with a flex fan. All of this I did with the help of my dad, a shop manual, and this forum. That's why when I finally got everything running and working like it should, I had to join this forum and post a couple of pictures of my truck. Thanks to all the members who post on here. Maybe someday I can someone the way the other members helped me! That's a good lookin truck. Awesome truck!!!! Enjoy driving it. Thanks guys! I appreciate that. I have to say that the previous owner, while he was not very good with the parts that make it "go," did a ton of great work bringing the paint back to life. All I did was slap a wax job on it. It has really been well-preserved. As soon as we can, we are going to get it up on a lift and undercoat everything. I do plan on keeping it in the garage, too, which should help a lot in keeping the rust away. I know my dad has told me stories about the Mikado my grandpa used to own. It was a red '79, and he bought it back in '81 or so. Even in that short period of time, that truck had started to rust. When my dad found this '76, he was amazed at the fact that it had no rust, except for a couple of fist-sized patches of surface rust on the top. Those spots were easy fixes, though. We just stripped the top, treated it, and shot it white. We didn't think we could match the yellow. 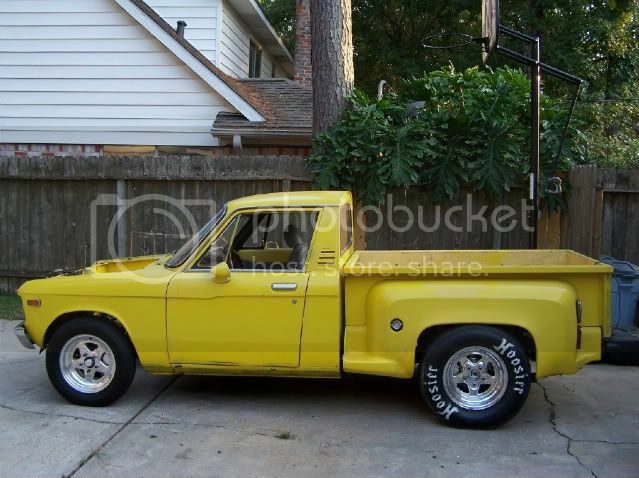 If I ever do repaint the truck, I will go back yellow, but I kind of like it as is. It shows some age, but it's old, and it should show it. Heck, I've only seen two other LUVs in real life, and both of them were drag trucks and highly modified. I had never seen an original. It's just so funky that it's cool. I think as long as I can keep the engine running and as pure as this truck is, I'm gonna leave it that way. Anyway, it's a blast to drive. I get the strangest looks from people. The other day I passed a 1972 or so AMC Hornet going the other direction. We honked and waved as we passed. It was just cool! these little trucks get a lot of looks. get use to that and enjoy the conversations your going to have.